From the creators of The Mystery of Krummhorn Castle (5 STARS - CBC) comes a Steampunk musical odyssey for the whole family! For young geniuses Ada and Lacey LaForge, there’s no problem that a ratchet and slide rule can’t solve. But their journey to find their long-lost aunt becomes a harrowing adventure that tests the limits of their ingenuity. Join the LaForge sisters as they outwit fearsome airship pirates, uncover astonishing family secrets, and maybe bend space and time a little. Kiss the Giraffe is back with a fantastical new musical. This steam punk adventure follows two genius inventor sisters who set out on a quest to find their mother and their place in the world. This show was fantastic! I loved the steam punk aesthetic that was very well integrated throughout. Steam punk, for those who don’t know, is a sci-fi genre set in the Victorian era with futuristic technology powered mainly by steam and gears. The set itself looked impressive with a giant backdrop and wings that were hand painted and filled with gears. The cast raised the bar for musical theatre. I could easily see this show transitioning to Broadway with the cast being so talented. I couldn’t even pick a standout because the entire ensemble was so strong. The singing was beautiful and the dancing phenomenal. I was blown away by this cast and you will too. The only issue I had with this show was volume. The cast was so strong that solos were often drowned out. I had a hard time hearing what was being sung to me so I missed some plot points. This is an easy fix with the addition of mics. Bravo Kiss the Giraffe and congrats on another great show! 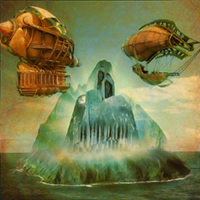 Meet vile and rakish rakes, tremble at an atrociously atrocious supervillianess, see some steam-powered aeroyachts fly, and watch airship pirates defy death with death-defying feats. Music and lyrics by Joseph Aragon; book by Heather Madill and Joseph Aragon, directly directed by Leith Clark.